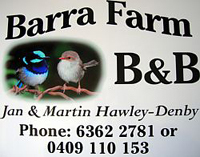 Barra Farm Bed and Breakfast is nestled on a hillside in a country garden on a 15 acre property overlooking the Meander Valley and the pretty town of Deloraine. 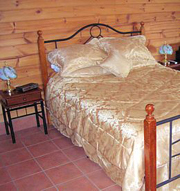 We offer accommodation for just one couple in our spacious guest suite which is separate from the main house, although under the same roof, so your privacy is assured. Relax and wander amongst the 370 Sauvignon Blanc and Pinot grape vines, take a fishing rod and catch a trout in the Meander River, delight in the blue wrens and scarlet robins and their joyous melodies. 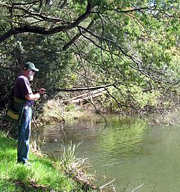 Our location on Highland Lakes Road provides easy access to Liffey Falls and the Great Lakes, as well as to the excellent selection of restaurants and facilities in Deloraine. Deloraine is centrally located and provides an excellent touring base for northern Tasmania as well as the Great Western Tiers, an area of majestic scenery, fabulous bush walks and a variety of other attractions. Our guest suite comprises one luxuriously large room with ensuite TV and DVD player queen-size bed fridge heater microwave tea and coffee hair dryer Barbecue facilities are provided outside. The suite is external to the main house but under the same roof. Undercover car parking is located directly outside the door of the suite. Maximum guests - one couple.